Yes, it’s still raining as you can see above. 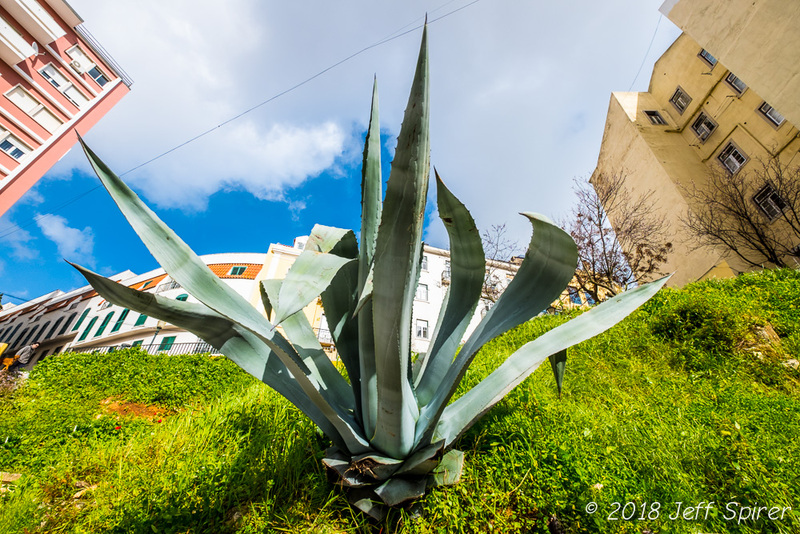 A local said to us today, “You moved to Lisbon for the weather, right?” The wind is also an issue, there are branches everywhere and it’s a bit frightening to walk under the trees as the wind gusts surge and ebb. There was a break for a few hours, seemed like a good time to take a walk and ride the bus with a direction but no destination. Because everyone was bundled up and rushing, it seemed a lot easier to photograph patterns on the street and walls than scenes with people. 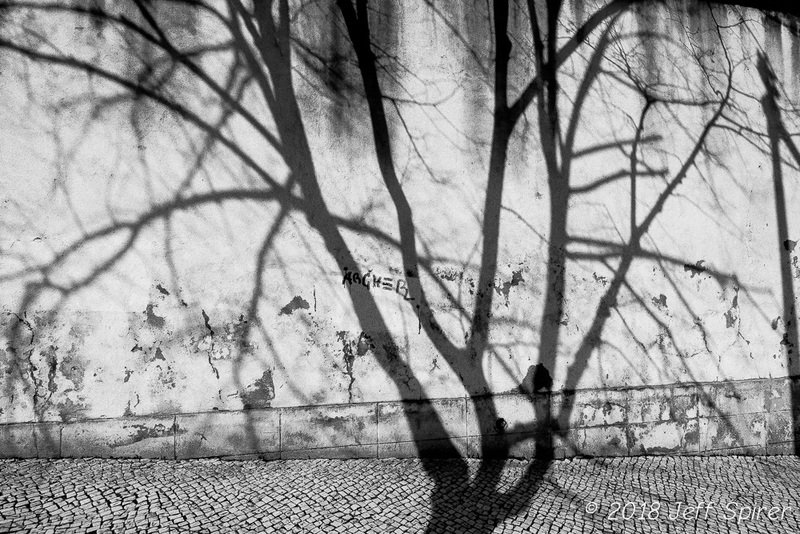 While tree shadows could be photographed anywhere, the sidewalk marks Lisbon in the frame. We took the bus to Alcântara. The area is ancient and until recently free from development. There are lots of nightclubs. We didn’t quite take the bus all the way, we were supposed to change buses but couldn’t find the stop for the second bus so we walked half a mile to a train station that provided a tunnel under the busy roads. 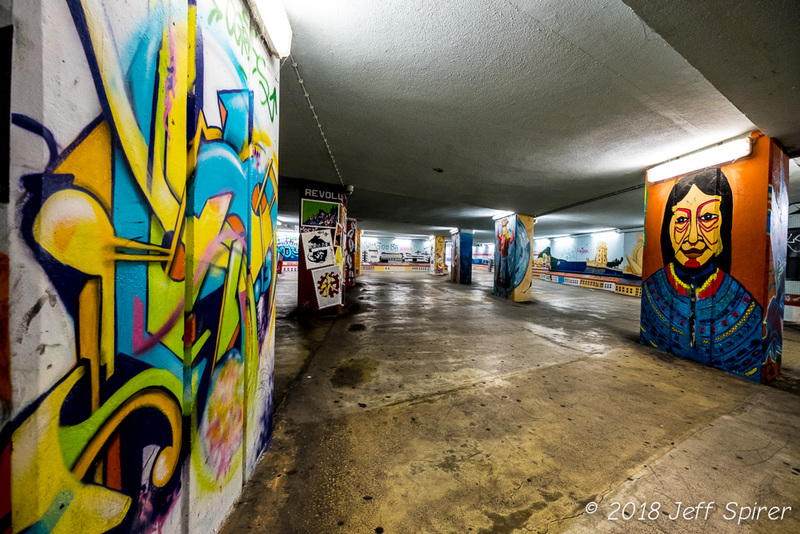 The tunnel was truly amazing, filled with wall painting and skaters. 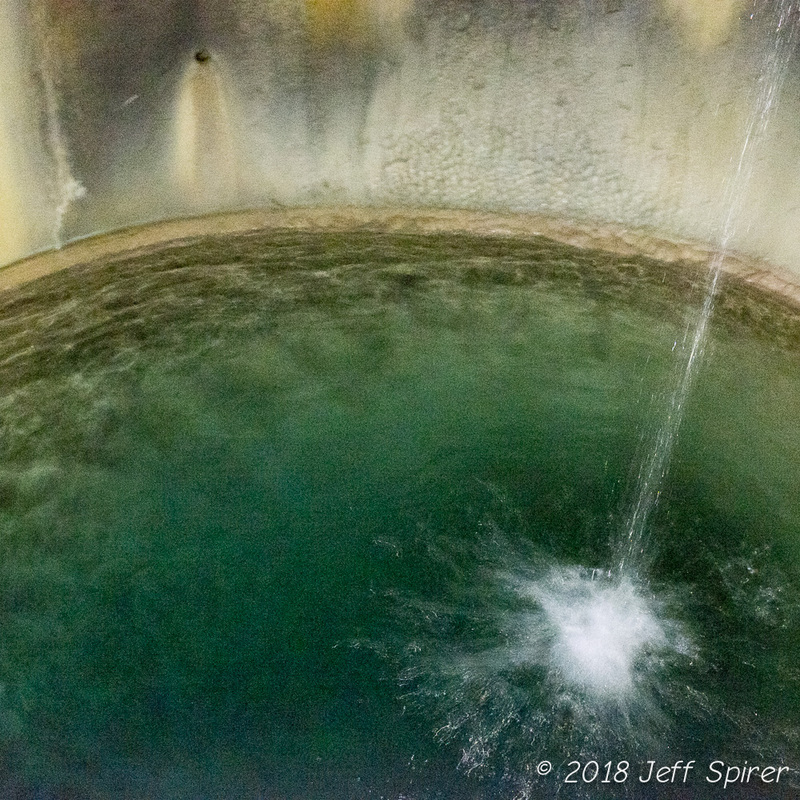 Had we not been so hangry, I would have taken the time to shoot some of the skaters, but the tunnel alone was fascinating. While the colors of the city tend towards pastels, except for the blue tiles on many buildings, the highway we crossed over showed how much appearance matters to the people who live here. 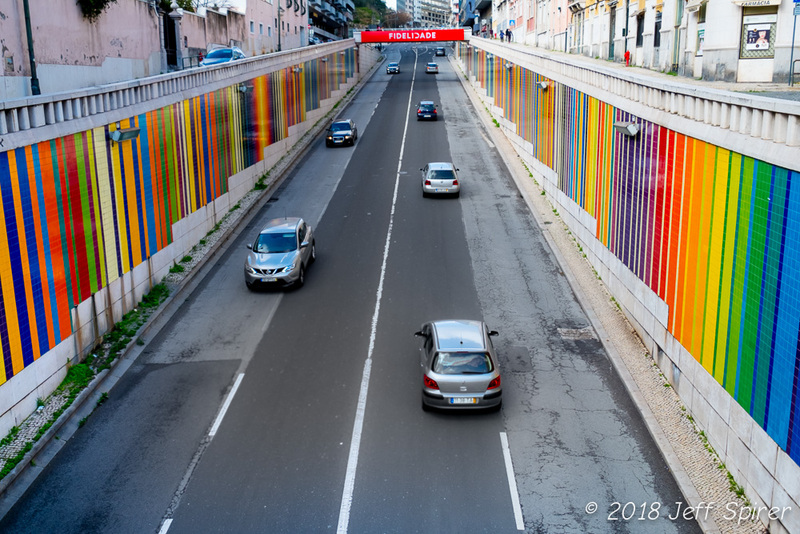 It would be unusual in the US to find such well-maintained color tiles along a highway. Given how much grit and dust there is in the city, they must clean almost this every day. 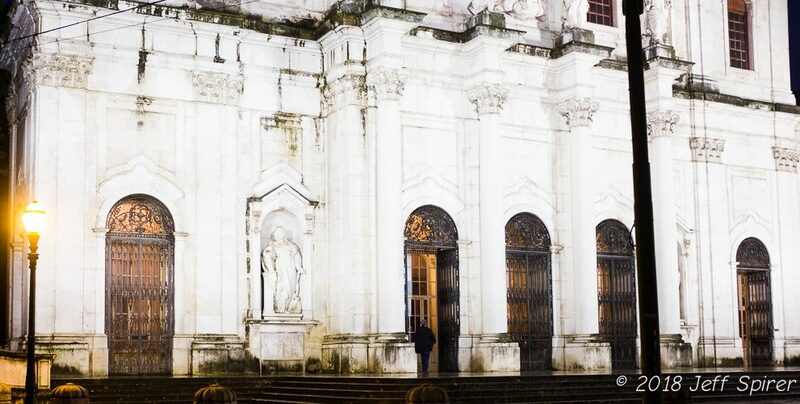 There are some really nice buildings in Lisbon. The most attractive areas are filled with blue tiled homes, clean and shiny. We don’t live in one of those, we haven’t seen them in the listings except for a few very expensive apartments. Most people here, like us, are in somewhat worn looking buildings with lots of character. 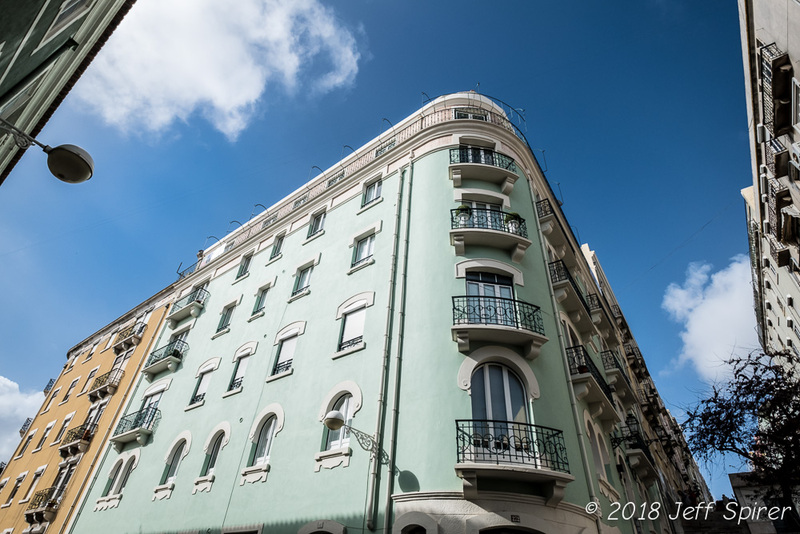 This building (above) in Alcântara was unusual. Of course there were some beautifully run-down buildings in between all the glamor. And finally, before the rain picked up again, I saw something encouraging for tequila drinkers. I’m not sure this variety can produce the right flavor, but it is here. Obviously not indigenous, it was apparently brought from Mexico to Spain by explorers. It does not grow in the wild, according to sources I read. Tomorrow is a busy day so there may not be any photos but I will be posting when I have enough to say and show. It’s been wet and cold since we arrived and looks like it will continue to be that way for a while. Last night, the rain was less persistent and we were able to venture away from our neighborhood. The 25 tram runs a few blocks from the apartment. 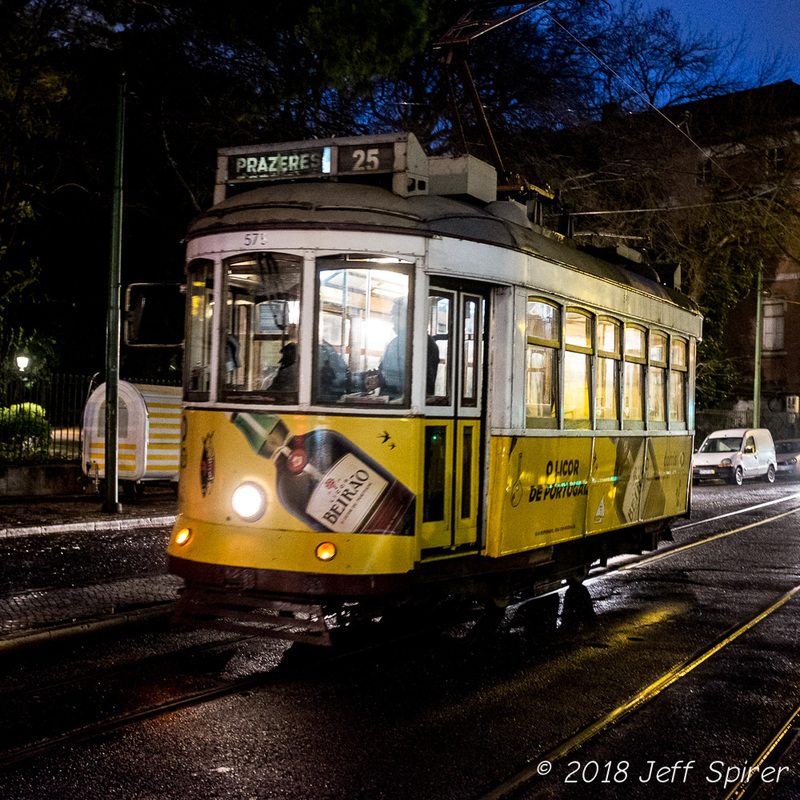 The trams are one of Lisbon’s major tourist attractions due to the quaint cars that look toy-like, it’s also useful to residents for negotiating steep hills, especially when the sidewalks are wet and slippery. The 28 tram is more well-known so it’s less touristed. We jumped on the tram and took it down the hill, towards the water, and it only had a few tourists, mostly French teens, on board. Rain had soaked the streets earlier, puddles forming everywhere. Streets glistened, offering their own special takes on the soaking that had dominated the day. 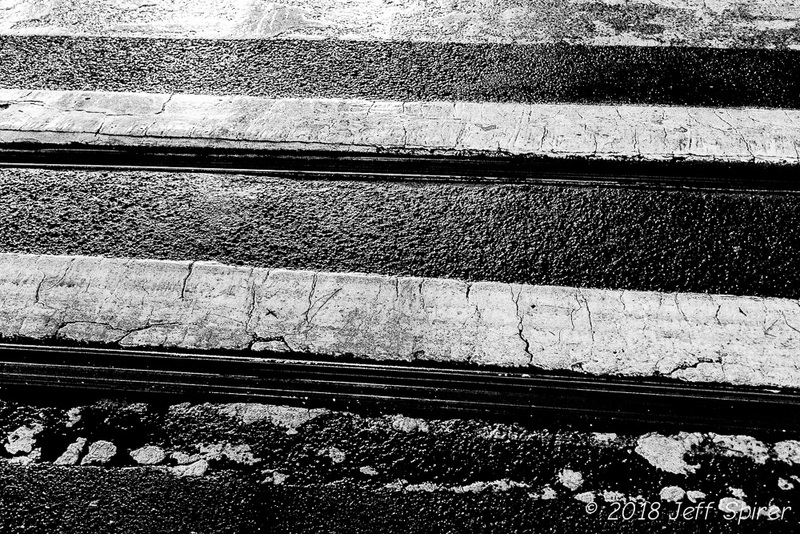 When we had waited for the tram, in the dark there wasn’t much to photograph without light, but the street crossing was lit by car headlights. A nearby park was mostly empty. 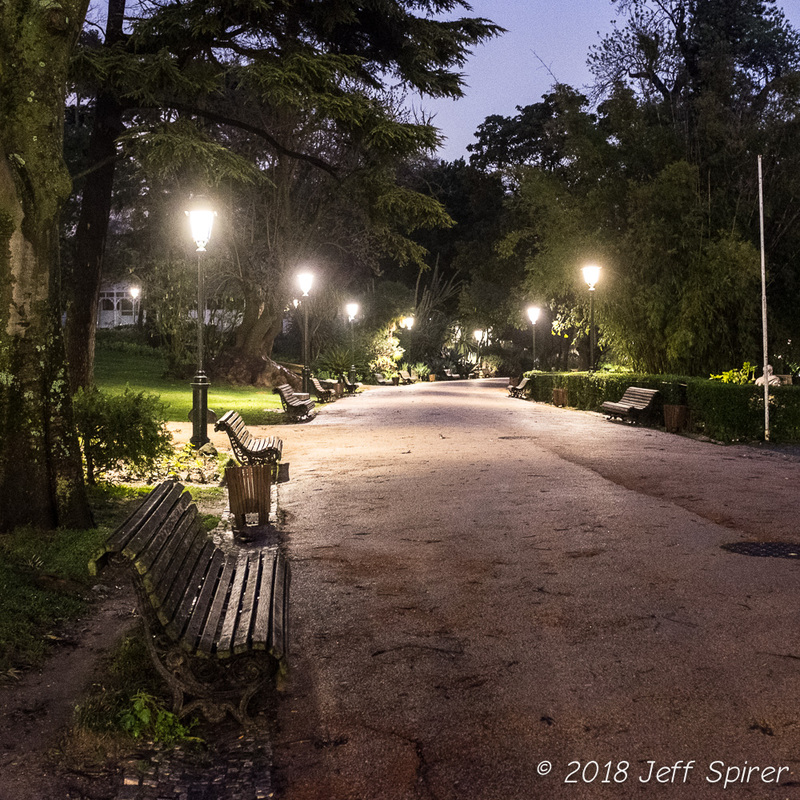 A few evening strollers passed through the gates but were gone by the time I had my camera out. Empty park benches are a photographic cliché that was worn out thirty years ago but I couldn’t resist. And a nearby church provided a distraction, at least photographically. Tanya spotted a restaurant out the clouded window of the tram. We stepped off at the next stop and walked up the street. It was packed with both tourists and locals and a constantly-in-motion staff. 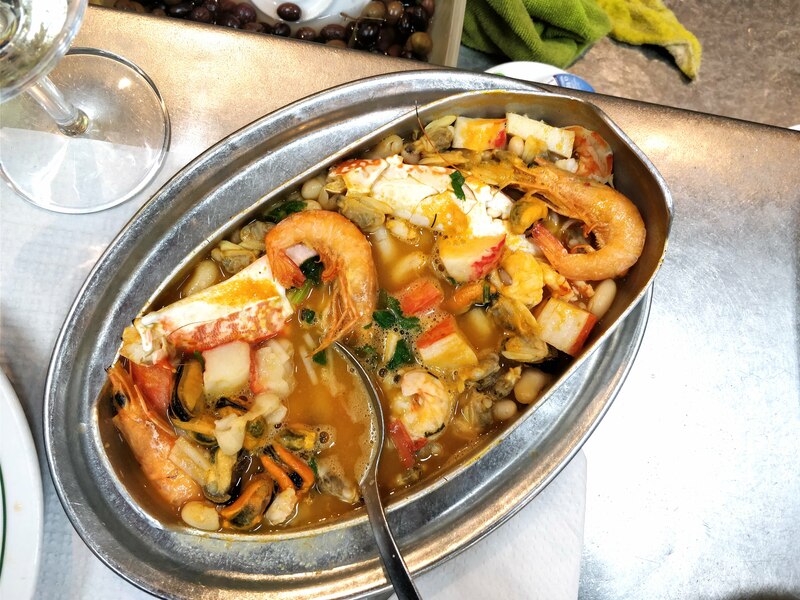 No idea of the name, but it offered inexpensive, excellent food and good company – we sat at a counter as the tables were full and made a new friend, a Portuguese man who lives in San Francisco. We have another couple days of tasks for the apartment and with the government, but after that maybe more interesting photos. 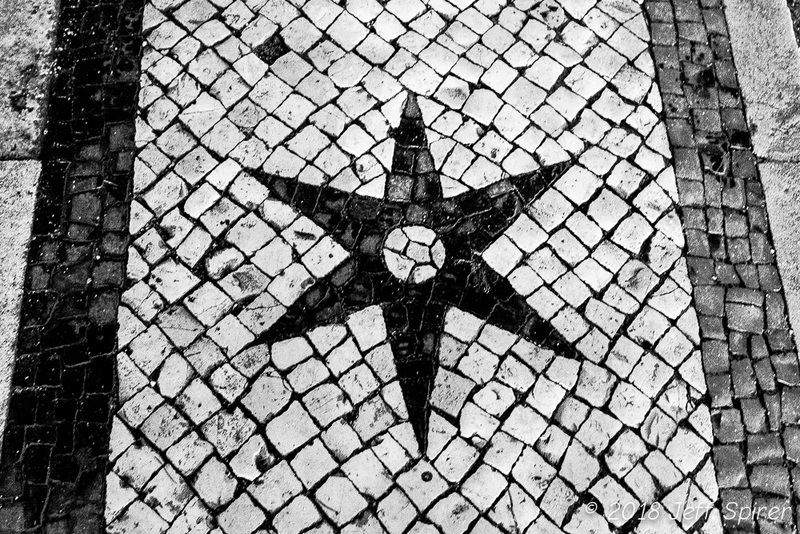 We arrived in Lisbon today. It was an unpleasant trip, two nights of redeyes with an entire day in Newark Airport’s dismal international terminal. 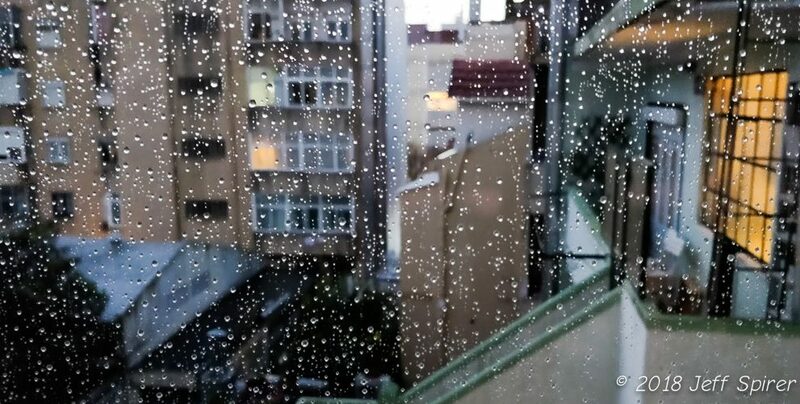 At Lisbon airport, exhaustion and heavy rain ruled the day. We reached our apartment four hours after landing even though it was only a thirty minute drive in rush hour. Nobody needs the details on this. The apartment was bigger than we thought and in a very nice neighborhood. 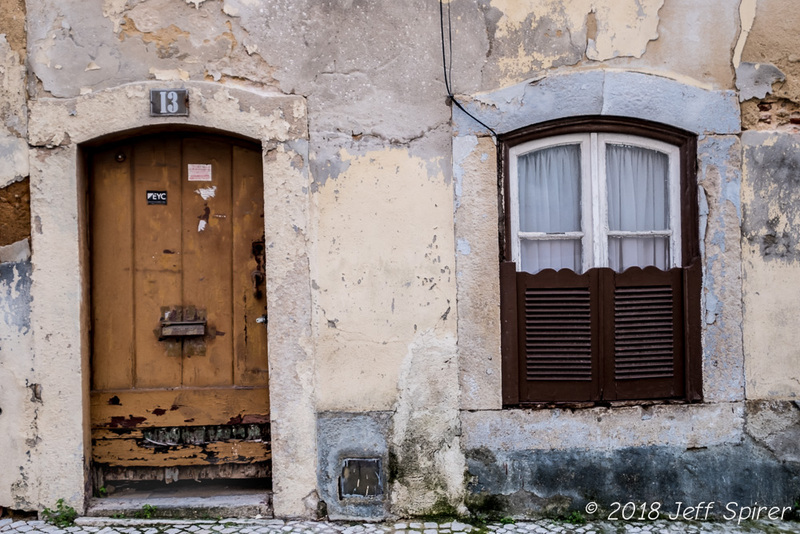 In typical Portuguese fashion (we had been warned), the light fixtures and mirrors had been taken by the last tenants. This appears to be the norm. It just added to the list of things we need to do to make it livable. Getting a bed is more important right now. Other than that, it is quite nice although some of the systems are a bit arcane coming from America. A little over half the day was spent setting up a bank account and getting internet and cell phones set up. The processes for foreigners that involve financial arrangements require huge amounts of documentation. Getting a cell phone/internet account set up required as much financial data as getting a small business loan in the US. It’s probably designed to avoid money laundering. On the positive side, the prices for the services are about 1/3 the US price with better performance. And the bank gives you a credit card without any type of credit check. Everyone that knows me is probably wondering where the photos are. I didn’t start shooting until we went out in the evening, so here they are. 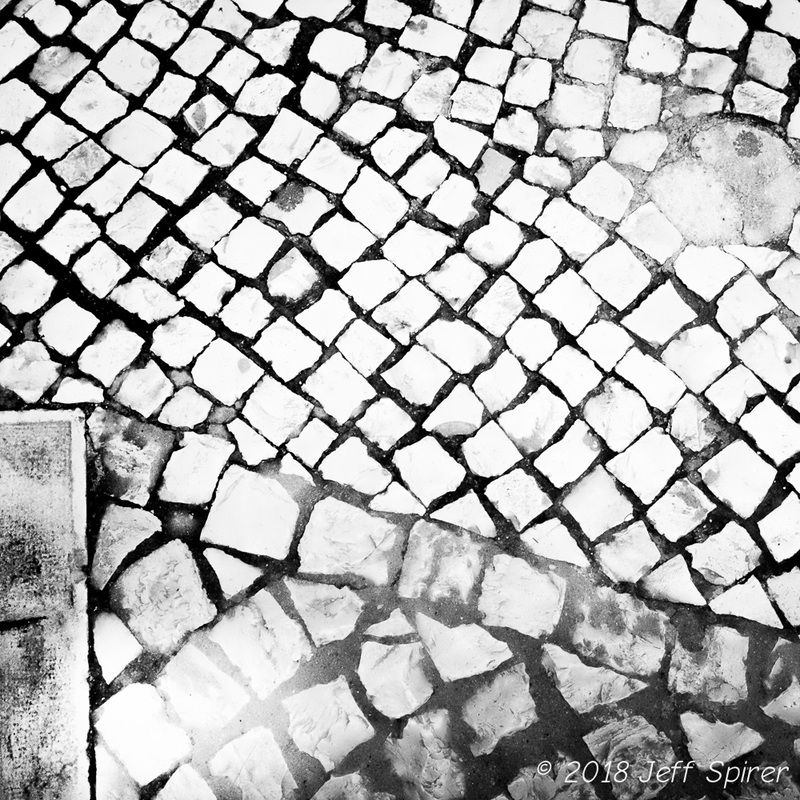 The sidewalks in Portugal resemble mosaics. They are very carefully laid in with putty-colored cut stone. Unfortunately, it’s a dying art as the cost is prohibitive in the modern world. The other issue is that they lack functionality in the modern world. 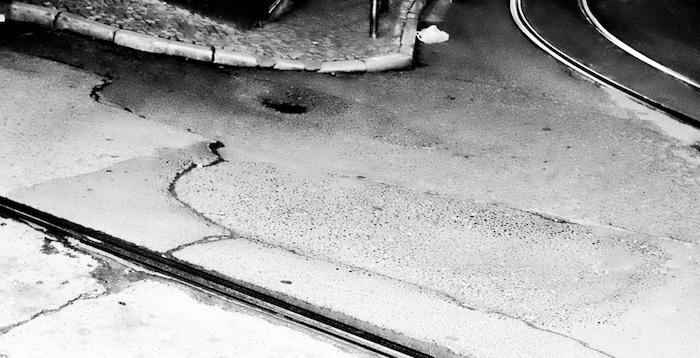 In past times, it didn’t matter if it took longer to get places, but even here, people have to walk without sliding down the street on wet stones or getting heels caught in the cracks. Sad, as the streets are like art here. Public art is big in Europe, much as it has been in San Francisco. 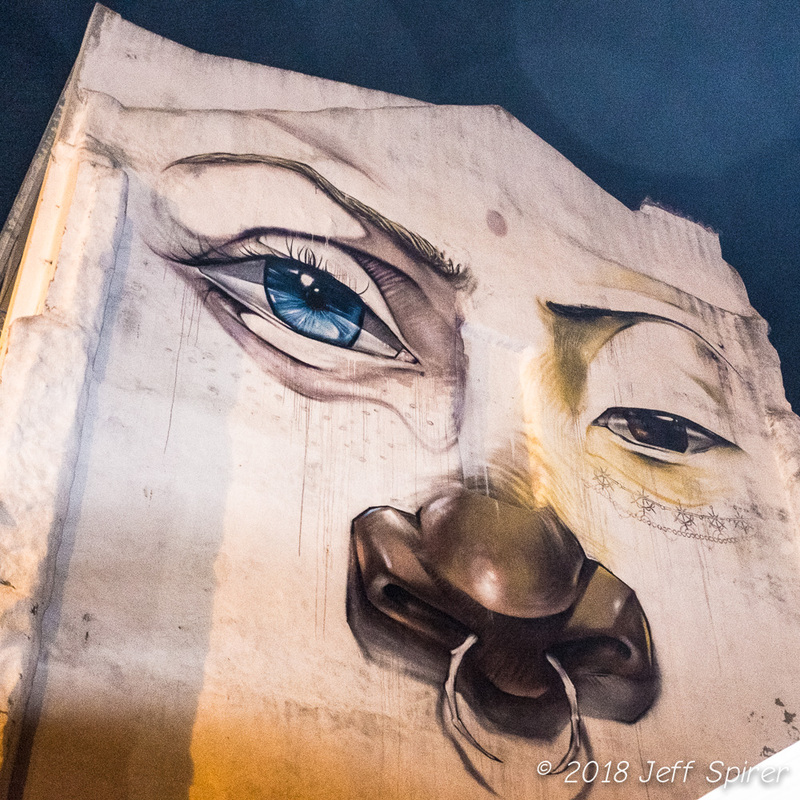 Buildings can be adorned with unusual and captivating images. 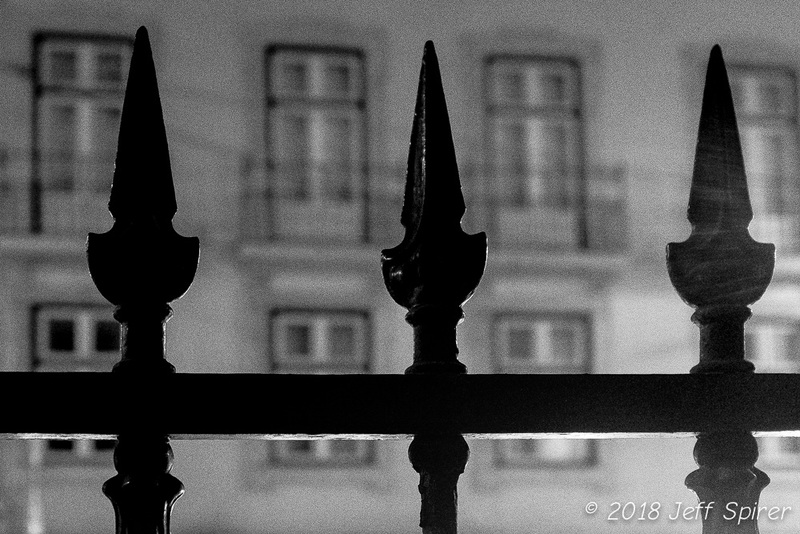 At night especially, they can bring joy and doom to the city. 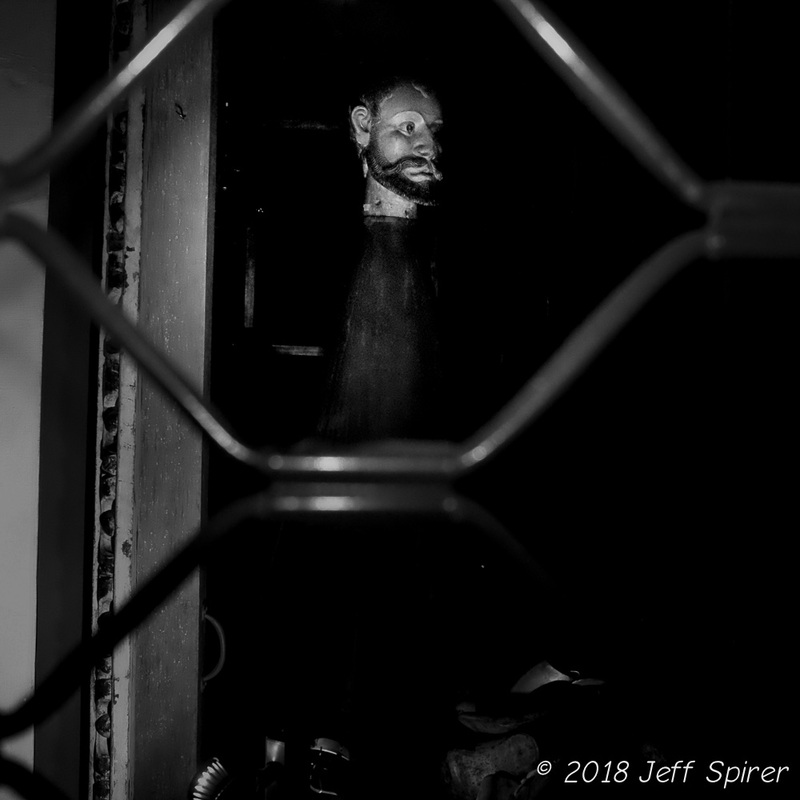 Window displays can also be artistic, especially in a creepy way rarely found in the States. Mannequins appear in strange places, positioned to frighten or just surprise. One of those oddities that the travel guides leave out. 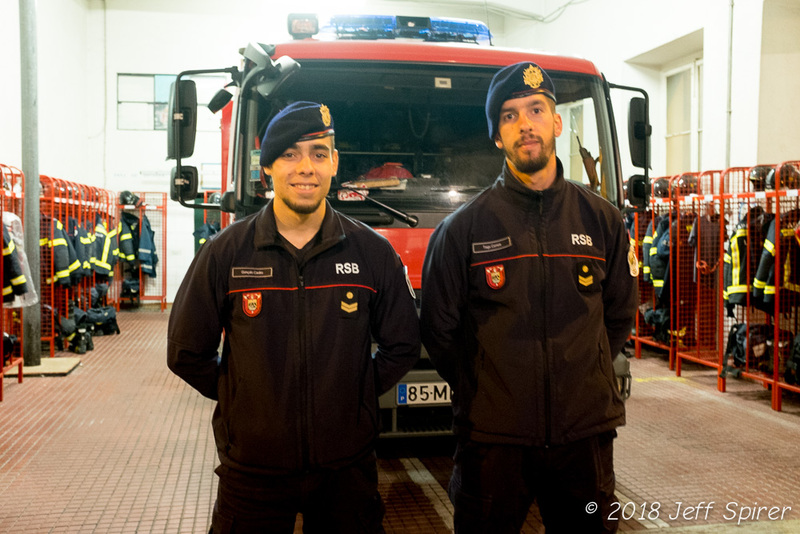 The big surprise of the night was spending time with a couple fireman at their station, although station is hardly the word for it. The building was inviting with 16th century walls and tiling. Wandering in, a couple firemen came out and, probably lacking any action for the night, told us about the history of the station. Originally a convent, there is a pool and inside waterfall that you can hear when you get close. And there’s a tunnel that is long and dark, apparently used to smuggle people out at some time in the past. 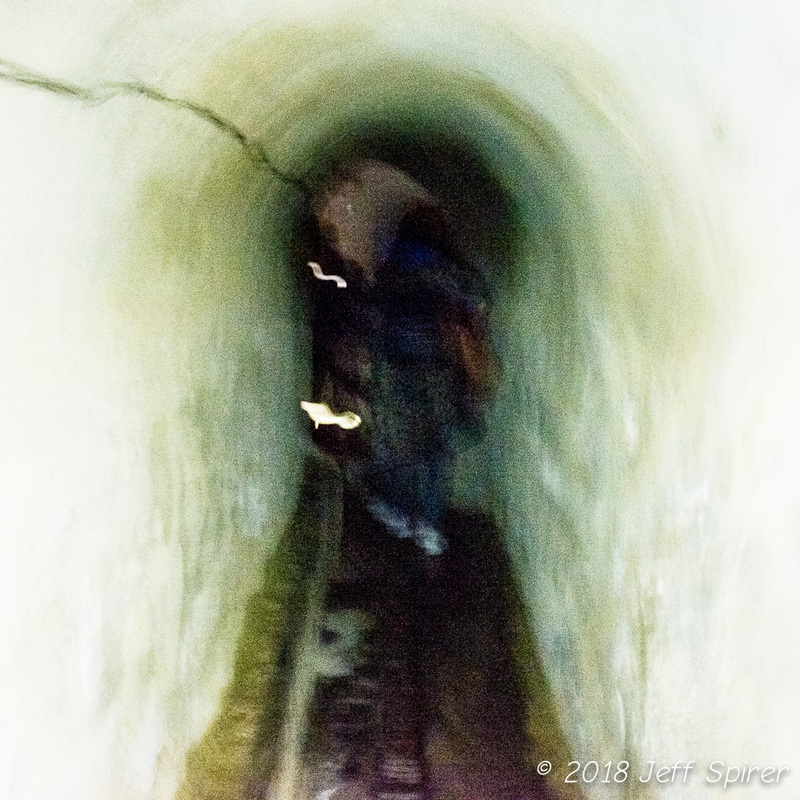 It wasn’t clear if it was the recent past or the distant past, but walking in a dark tunnel with the sound of water splashing down and only a cell phone for light was pretty creepy. Of course I asked the firemen to pose. Maybe more tomorrow, but we really need a mattress so we can move out of this hotel.